How to determine the date of production/manufacture or age of Thermo Pride® HVAC Systems. The manufacture date of this brand is NOT coded into the serial number. 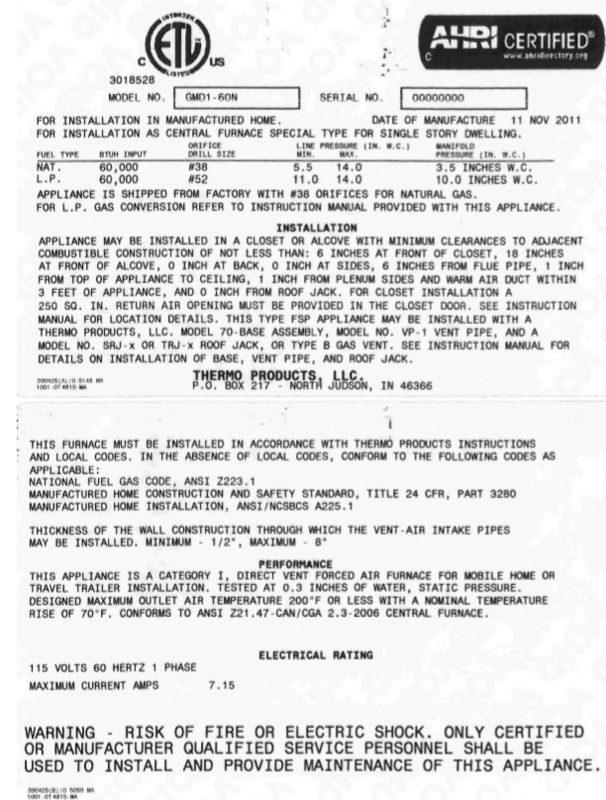 The date of production/manufacture or age of Thermo Pride® HVAC equipment can be determined from the “Year built” date (when provided) located on the data plate. Otherwise, contacting the manufacturer is necessary. Or use other estimations such as gas regulator valve date, or ANSI or CGA code date. Description: The model number, serial number and manufacturing date are located on a silver label on the inside panel. The manufacturing date appears in the upper right corner of the silver label in the MM/YYYY format. If the tag fails to provide this information the manufacturer must be contacted. When contacting the manufacturer (800-476-4328) have the model & serial number handy.